Here are the 10 best websites for small group leaders and ministry point leaders as judged solely by me, Michael Mack. Part of the mission of Small Group Leadership is to resource leaders—or, in this case, point you to some of the best resources—to help you carry out the mission God has given you. I not only use all these sites to varying degrees, I’m also involved in some of them, which I’ll note, below. Take that statement as my full disclosure. These sites are divided into two categories: ministry organizations and individuals. The order in each category isn’t that important; what is critical, I believe, is that you discover and utilize great resources that help you lead well. So here we go: the 2016 Best Websites for Small Group Leaders. Yes, I founded this ministry way back in 1995, using a dial-up modem out of our basement in Cincinnati. Today it’s owned and operated by Christianity Today, and it’s come a long way! My guess is that this site has more available for leaders than any other, and it’s also very easy to navigate and utilize. Many of the articles on this site are free, or you can download some of the training tools, Bible studies, or videos a la carte at a starting price of $4.95 each. You can also get an individual or multi-user subscription. Steve Gladen, Global Pastor of Small Groups at Saddleback Church since 1998, founded the Small Group Network to help Small Group Point People discover answers to their questions. This truly is a network of small group point leaders from around the world who provide one another with encouragement and support. One of the key ways this network works is through local huddles of point leaders to share ideas, resources, and to build relationships. The site also provides a blog written by various members of the SGN team, a small groups job board, and a schedule of Small Group Network events. 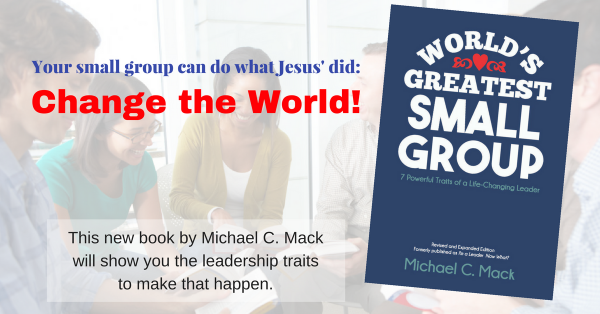 If you are the point leader of small groups in your church, the Small Group Network should be one of your most-clicked bookmarks. Be sure to register and jump into all the encouragement and support. The mission of Small Group Churches is to be an influential small group community, linking pastors and leaders to like-minded resources, events and organizations. Andrew Mason, the small groups pastor at Real Life Church in Northern California, founded this online community of leaders. I, along with Steve Gladen and Scott Boren, join Mason on the SGC team. The site includes relevant articles and a blog, but the two best things about this site are the videos (which you’ll notice first at the top of the homepage) and the forum. Mason boasts (in a good way) that Small Group Churches is the “#1 self-hosted online forum for Small Group point people, pastors and leaders.” The site says, “We are not THE resource for everything small groups, but we believe we can help you find the resource(s) you need.” The forum makes this site unique and very useful for leaders looking for answers to small group questions. Joel Comiskey is recognized around the world as a leading authority on the cell church. His ministry, Joel Comiskey Group is “dedicated to helping complete the great commission in this century by providing resources and coaching to plant new cell churches and transition existing churches to cell-based ministry.” Even if you’re not a cell church, however, this site has lots of great resources, a well-written blog written by various leaders, and a bookstore that includes many of Comiskey’s 28 books primarily focused on life-giving small groups (cell groups). Not to be confused with SmallGroups.com, this site, developed by LifeWay, provides Bible studies that can be customized for your church or group. This is a fee-based site that charges based on the number of groups using the membership. The pricing currently starts (accessed 4/27/16) at $199.95/ year for one group and goes up to $5,999.95/year for 100+ groups. (Monthly memberships are also available.) You can check out the program with a free trial on the site. One of the neat features is that if you can’t find a study that works, you can request a study on the text or topic they haven’t covered and they’ll write it for no additional charge. Allen White has been involved in small group ministry for more than 25 years in churches and as a coach/consultant working with hundreds of churches (he must have started when he was 10). The site’s tagline says it all: “Taking the Guesswork Out of Groups.”™ The blog posts are excellent and are geared mostly toward small group point leaders. Allen often interviews point leaders and others in his “5.5 Questions” feature. (See the one he did with me here.) The site also includes Allen’s courses, info on his coaching ministry, and his small group webinars. Jim Egli is the Leadership Pastor at Vineyard Church in Urbana, Illinois. He’s also one of my favorite authors of books on small group leadership. Jim’s blogs challenge me to think beyond the normal small group/discipleship/evangelism boxes, so I try to read everything he writes. Besides the blog, you’ll find lots of great small group, discipleship, and multisite resources. But one of my favorite parts of this site (actually, it’s on a separate site) is his Small Group Icebreakers, categorized into Light, Moderate, or Deep. Bill Donahue is simply someone you want to follow if you’re involved in small group ministry. Leadership is often defined as influence, and if that’s true, Donahue is the epitome of a godly leader. His vision is to “resourcing life-changing leaders for world-changing influence.” I first met him when he was Director of Leader Development and Small Groups at the Willow Creek Association and Church and today he’s a popular conference speaker, prolific author, and leadership consultant. His site includes his blog, his books and other resources, videos, and more. The only knock I have on the site is that as I write this today, the blog has not been updated for six months. Still, the resources and past posts are worth the time to read. Scott Boren and I have been ministry partners for years. We’ve edited each others’ books, often seek each other’s advice, and have similar convictions about the church, groups, discipleship, etc. I had the students of my Small Groups & Discipleship class at Cincinnati Christian University read his book, MissioRelate mostly to challenge their thinking and help them catch a new vision. Boren is the author of I-don’t-know-how-many books on groups, all worth the read. He blogs on the topics of and often includes adaptations from the books. Mark Howell is a prolific blogger who has probably forgotten more about small group ministry than most of us have ever known. He’s so prolific, in fact, it takes two websites to contain all the good material! He is the Pastor of Communities at Canyon Ridge Christian Church in Las Vegas, and has more than 25 years of small group ministry experience in several churches and as a consultant and coach with a wide variety of churches. Be sure to check out the Services tab on his site to see the types of helps he offers to churches and leaders. What small group sites did I miss? Please comment below, and I’ll consider them for the next list!